Merlis Belsher's transformative gift of $12.25 million that launched the Home Ice Campaign is an inspiration not only to donors and community leaders, but also to current U of S students. 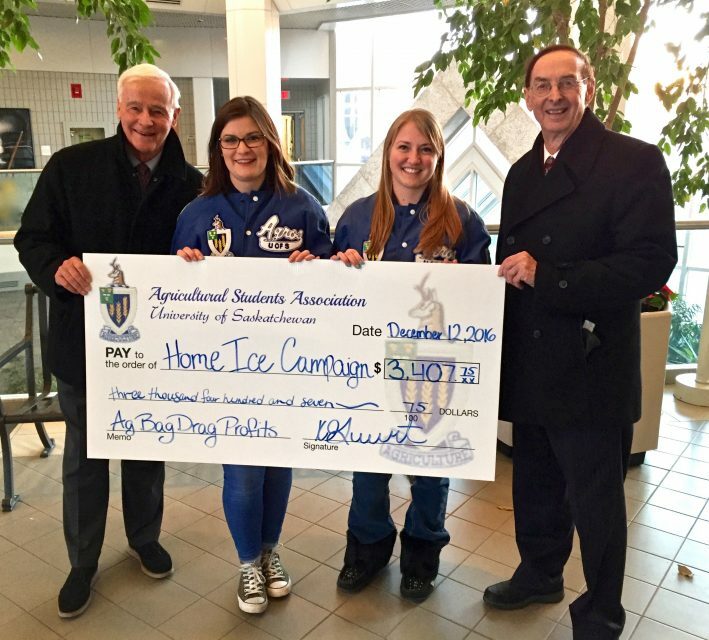 The Agricultural Students Association (ASA) followed the lead of Belsher and a number of other donors by making a gift to the campaign. The $3,400 donation was made using the profits from the association's annual social event. "It was a great honour to get to chat with Merlis and Dave," said student Bayley Blackwell, ASA social director. "It is so exciting to have such a great cause to support that benefits the entire campus." The Home Ice Campaign is raising funds to build a brand new multi-sport complex at the U of S.
For more information on the Home Ice Campaign and to make a donation, visit home-ice.ca.